Greenspan's biography of William Wells Brown brought the nineteenth century's most prolific African American writer to the attention of the public. Image courtesy of W. W. Norton & Company. Throughout Ezra Greenspan’s career, the National Endowment for the Humanities has supported his work on groundbreaking biographies that have brought new perspectives and voices to college and high school classrooms. From his first book on George Palmer Putnam, to his recent biography of William Wells Brown, to his current project, a biography of Frederick Douglas’s family, NEH funding has helped Greenspan illuminate the lives of historical figures and the histories of books and publishing for a broad audience. Greenspan awarded an NEH fellowship for archival research, in support of his work on George Palmer Putnam. Greenspan awarded an NEH fellowship to write his book on George Palmer Putnam and Nineteenth-Century American Publishing. George Palmer Putnam: Representative American Publisher is published by Penn State University Press. William Wells Brown: A Reader (edited by Greenspan) is published by University of Georgia Press. Greenspan awarded an NEH fellowship for his research on William Wells Brown. The Library of America publishes William Wells Brown: Clotel and Other Works, edited by Greenspan. William Wells Brown: An African American Life is published by W. W. Norton & Company. Greenspan awarded an NEH fellowship, through the American Antiquarian Society, for his work on Frederick Douglass. George Palmer Putnam: Representative American Publisher (2000) explores the life of nineteenth-century America’s most significant publisher, a man whose career and investments gave rise to modern commercial publishing in the United States and fostered the careers of Herman Melville, Nathaniel Hawthorne, and Edgar Allen Poe. An NEH fellowship helped Greenspan undertake the in-depth archival research necessary to complete the project. And the book had a significant impact on literary study in the United States, helping the study of publishers and publishing history to become a major part of the field. Greenspan is a founding editor of Book History, a peer-reviewed journal. George Palmer Putnam: Representative American Publisher explores the life of nineteenth-century America’s most significant publisher. Image courtesy of Penn State University Press. 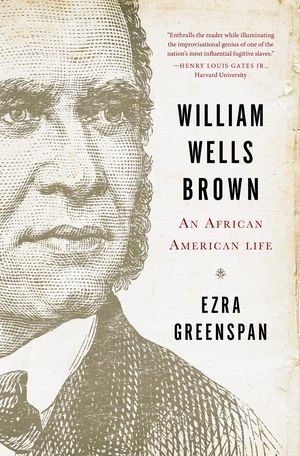 Greenspan’s most recent book, William Wells Brown: An African American Life (2014), has had an even broader reach and was supported by an NEH research fellowship. A biography of the nineteenth century’s most prolific African American writer and abolitionist, William Wells Brown was reviewed by The New York Times, Public Radio International, The Washington Post, and the Kansas City Star. Most importantly, the biography has helped both scholars and popular readers understand the scale of Brown’s contributions to American history and culture. While he was previously overlooked, we now understand that Wells was arguably the most important black writer of the nineteenth century. Brown’s writing is now being read in high school and college classes. Greenspan himself has also drawn attention to William Wells Brown through radio and television interviews—he has been featured by PRI’s The World and on C-SPAN. Wells has delivered public readings at a number of universities and the Library of Congress. Greenspan edited the Library of America's 2014 edition of William Wells Brown's major works—making his writing publicly accessible for the first time in decades. Image courtesy of the Library of America. Greenspan is currently working on a new, collective biography of Frederick Douglass and his family, again through the support of the NEH and the American Antiquarian Society. For Greenspan, these grants have “given my academic career a kind of momentum and comprehensiveness that it likely would not have had otherwise”; they have allowed him to complete significant works of biography and history within shorter time frames, helping more of them reach the American public.